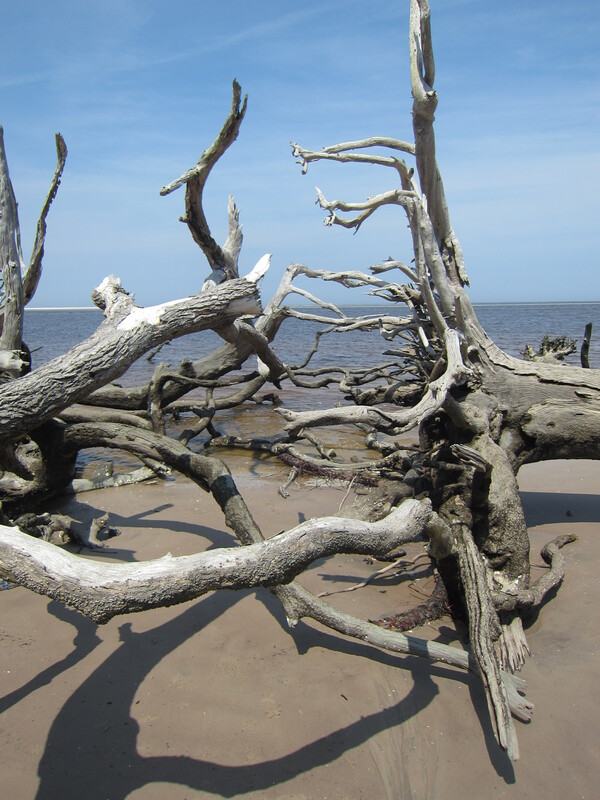 The sun-bleached skeletons of great trees toppled by erosion lie wrecked about the beach like the aftermath of a bloody battle. 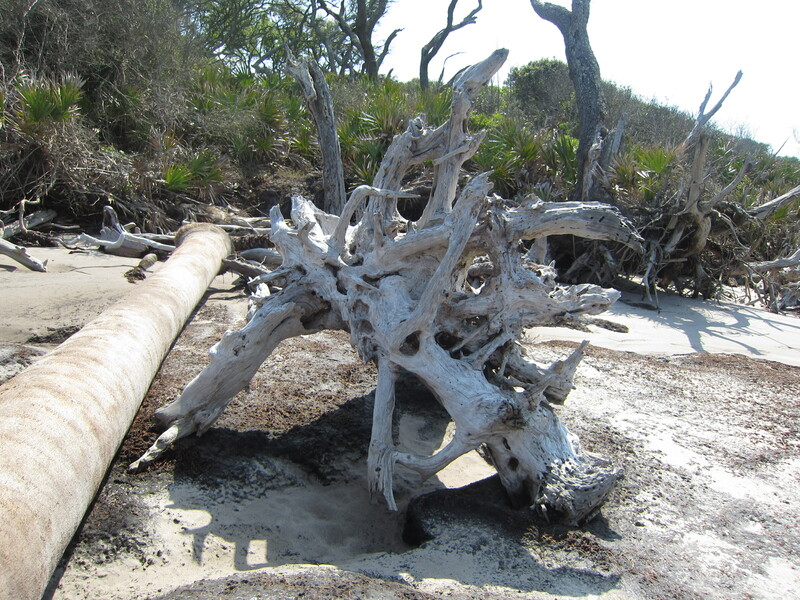 There’s a reason people call it Boneyard Beach. 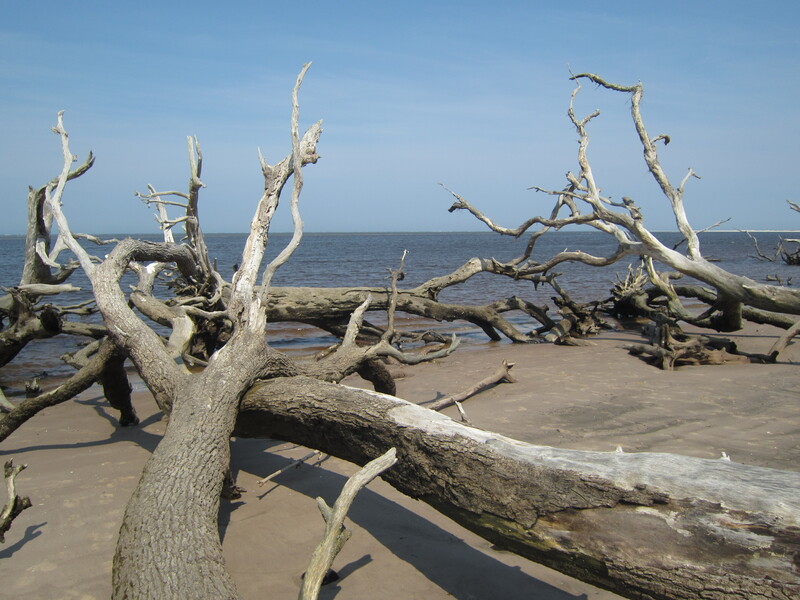 Though the scene is not one of Matthew Brady’s photographs of Civil War battlefields piled high with corpses, I can see how the sharp and splintered boughs and branches cut one tree into another and pierced the sand and sea foam as they crashed. The sharp-plated armor of a palm trunk juts from a mass of cedar root as though javelined into the cedar by a fleet and fierce scrub oak. But when I look closer at that bleached palm, I forget my metaphors of tree wars, because the palm shards remind me instead of the strange small armored body of a pangolin. The tide pools among the black rock abound with crabs and shellfish. The rock is sedimentary, but looks volcanic. 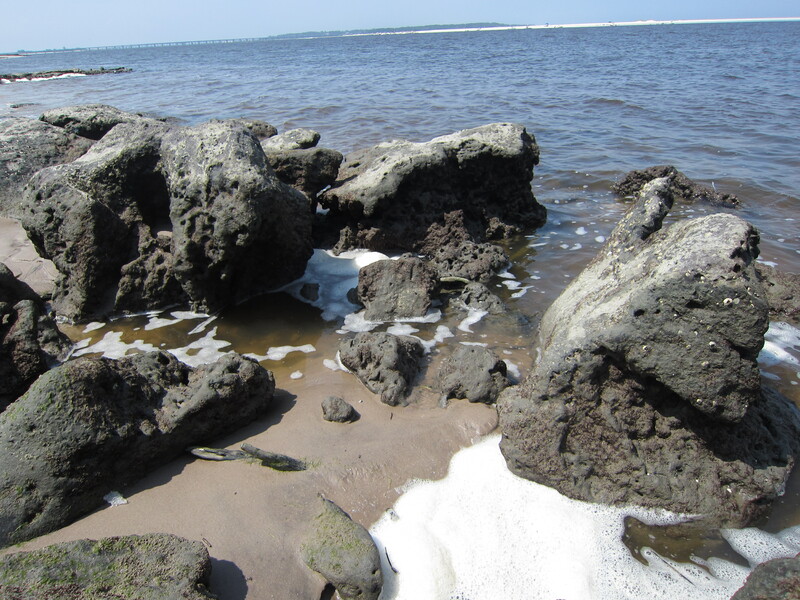 Nowhere else in Florida is beach rock black but at Black Rock Beach. My daughter and I walk between upended bodies of roots and the bluffs from which they eroded. 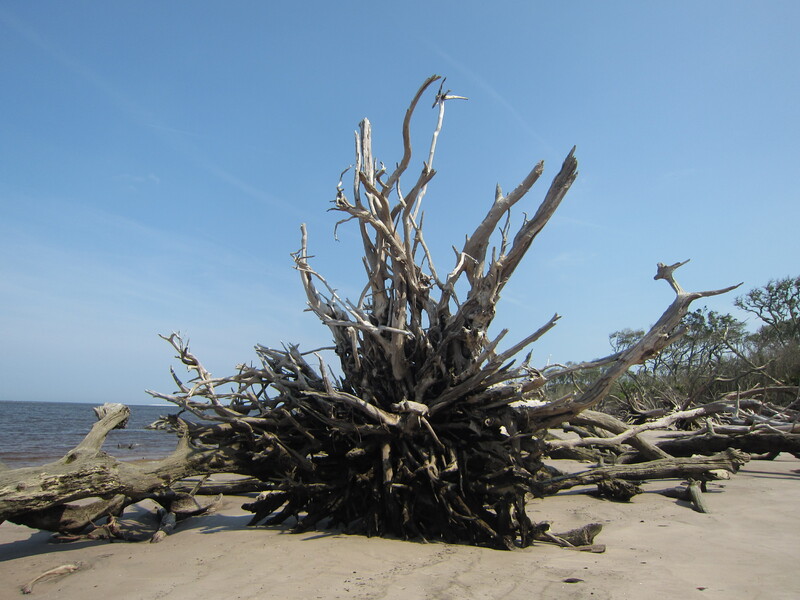 And now I think of the collapsed trees as sculptures and the destructive forces of storm winds and erosion as creative. Isn’t destructiveness so often the result of creativity not channeled to purpose and beauty? And doesn’t the beginning of the world come from the end? Look. Here’s a bleached and salt-preserved body of root that looks like bone and reminds me of Georgia O’Keeffe’s Cow Skulls. Emily and I tip our toes at the surf and mix metaphors. 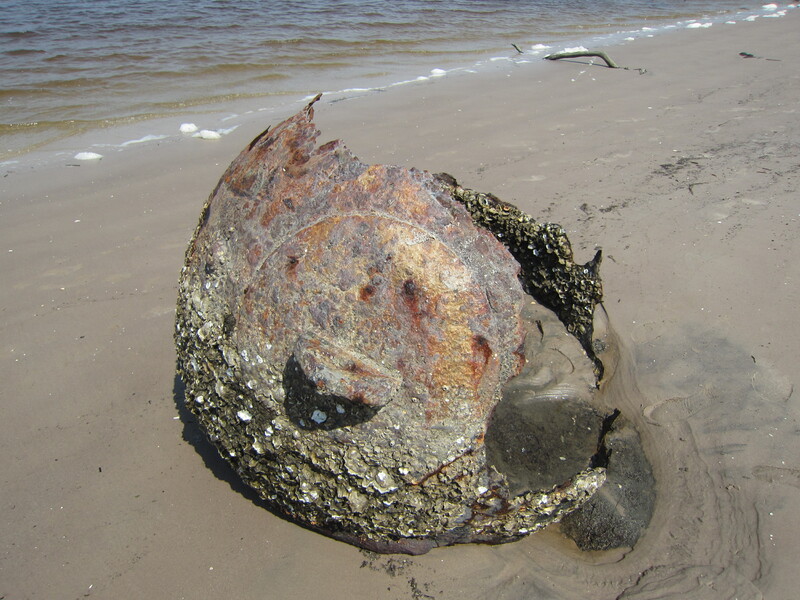 We find half an iron carcass of a barnacled buoy. The colors in the rust range from bronze to gold to green. Emily climbs inside and pretends to hatch from a dinosaur egg. After she hatches, I turn the rusted buoy into a giant witches’ kettle, grab an arm’s length of driftwood, toss in several more metaphors, and mix them carefully. I love the angles at which these supine giants point to the sky. Once they pointed straight up. Now they point fallen, at happenstance between sky and sea. Sometimes they accidentally reach up like painful arthritic fingers. But it’s harder to imagine pain here, despite the “incidence rate” of collapse and the crumblings of the bluff. An old man walks barefoot by himself, looking mostly down at the sand. I can’t figure out if he looks at peace or in mourning. If both are possible at once, I’ll believe it of him. Two young women play with a Great Pyrenees Mountain Dog in the water. His name is Pegasus, he weighs 110 pounds, and he’s all fur and smile. The bearded young man who came with them sits on the sand facing the water and plays soft guitar. British General James Oglethorpe, after whom was named my father’s birth town in Georgia—present population 1200—named Little Talbot Island and Big Talbot Island, where Black Rock Beach / Boneyard Beach is located, after early-1700s British Lord Chancellor Charles Talbot. Emily does cartwheels in the sand and holds sea foam in her hands. She loves the beach and she loves discovering new kinds of places. The tide comes in. 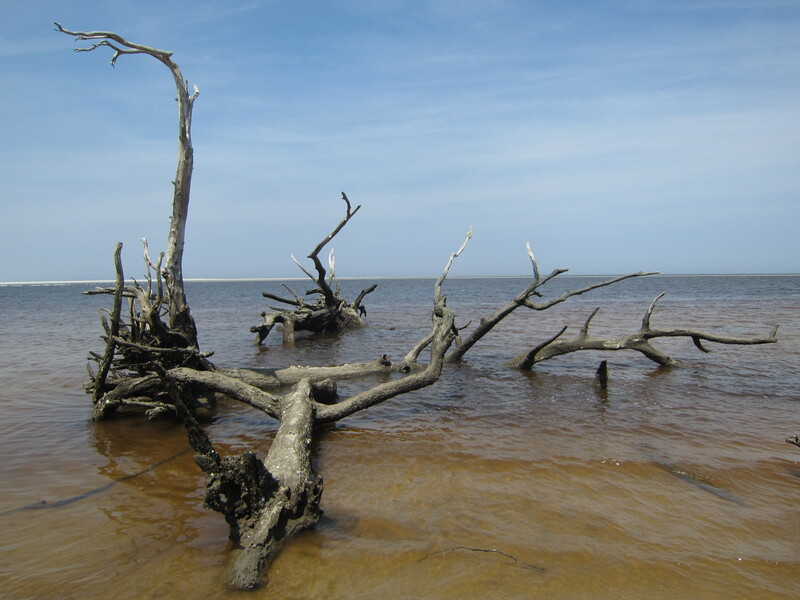 Carapaces of fallen trees now anchor in the rippling waters like shipwrecks. The water that meets the land is brackish and slightly tannic. 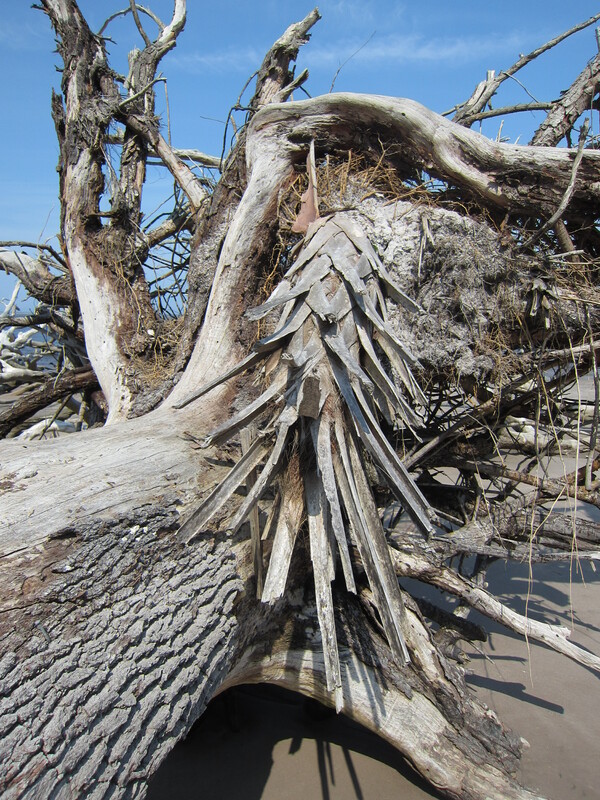 It comes from the sea but it washes through inlets and creeks and island keys before it gets to Black Rock Beach. Emily climbs a fallen and weathered wooden giant and we talk about treehouses and Swiss Family Robinson. If I look long enough, I can see the broad and twisting branches move. They reach elegantly curvilinear toward the blue sky. We walk between two large root systems facing each other, but when I say “face,” I see instead roots that look like arms reaching from one fallen tree to the other. So I continue to mix metaphors, though I’ve left my barnacled-buoy-witches’-cauldron far behind. 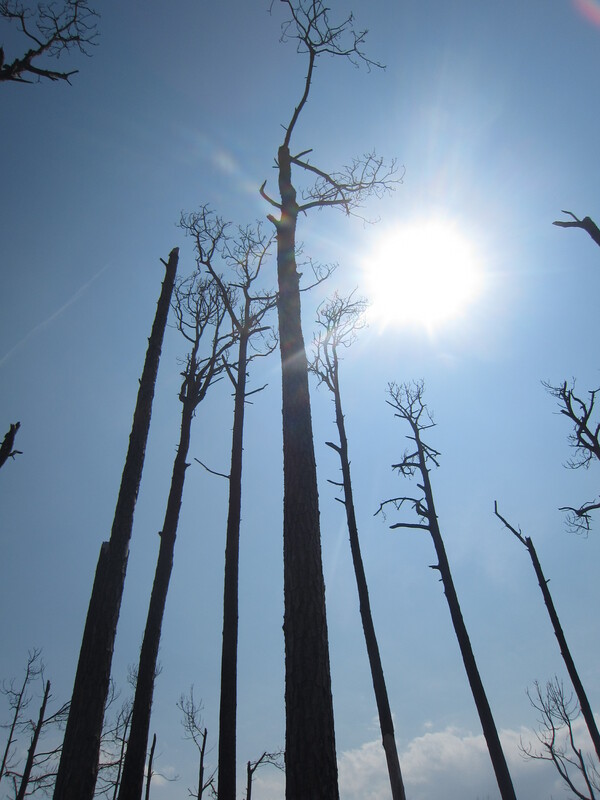 We come to a stand of burnt and blackened tall dead trees. 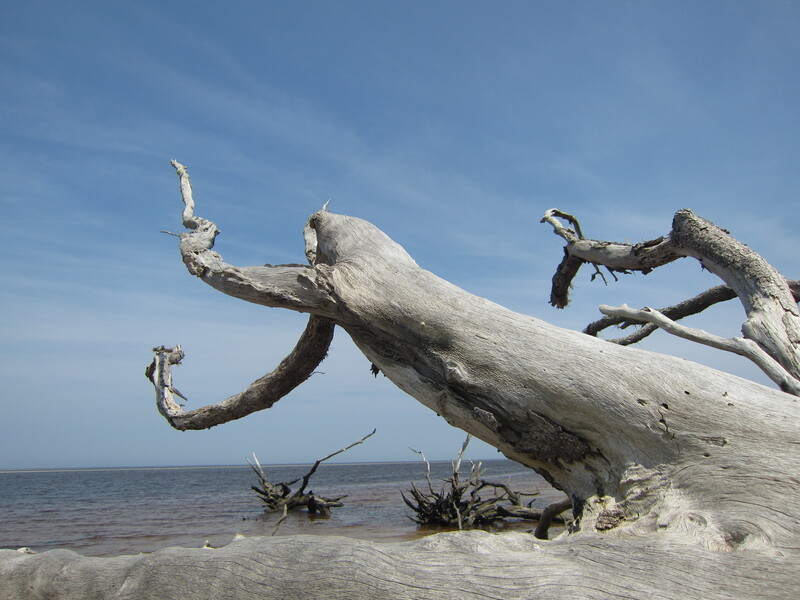 If fallen whitened trees protrude from beach sand and black rock, broken rib cages of beached leviathans, these trees stand up straight like eroded backbones whose surrounding torsos have fallen away. 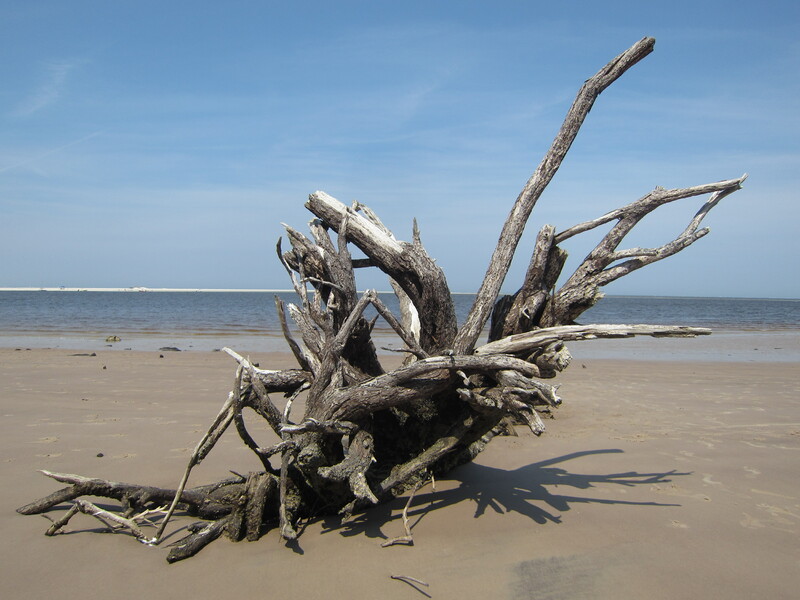 Coming back to the sandy bluff down which first we slid, we again approach these weathering and weathered Titans. Such giants are too often taken for granted while they live and thrive, but fallen dead and pale across the beach of black rock, they create an amusement park, built for no one, of beautiful bone and precious death.